28 days of work a month. That’s the average number of days a month that factory laborers work in three facilities I visited last week in China. Daily schedules vary between the hours of 8:30am and 9:30pm, but basically boil down to 60-80 hours a week with a few days off at the end of the month after payday. Depending on their level of skill, laborers (as opposed to supervisors) make between 2500 and 4000 RMB/month ($367-$587 on current exchange). In the sense that the factories in the south of China were extremely hot and I was sweating while I was on the production floor, “Yes.” To the minds of most Americans, I would assume, “Yes,” as well, for less literal reasons. It doesn’t sound like something most of us would sign up for or wish upon others. To many, I’m sure it sounds abusive and possibly illegal. But then I think most people would reflect that they know an ambitious person who works 60-80 hour weeks, with rare days off, maybe a banker, consultant, entrepreneur or single mother… but then again for vastly different compensation. I did not perform Thayer Certified audits at these factories, but I would bet heavily that the labor performed there is purely voluntarily and the workers, if asked, wouldn’t see anything unfair or criminal about their working conditions. 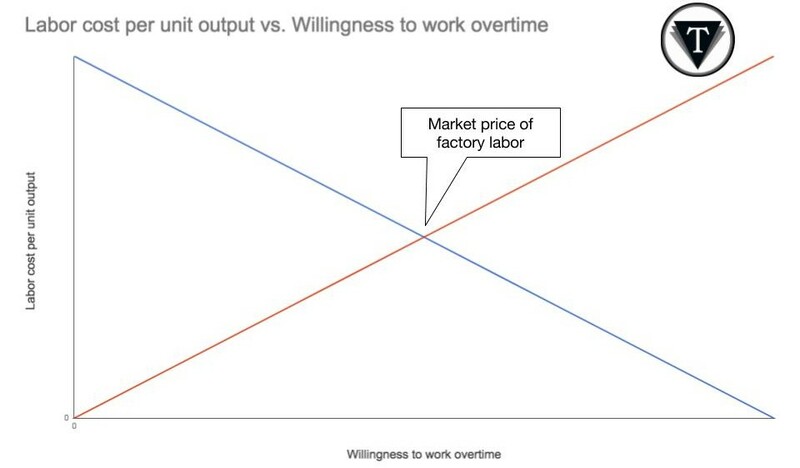 In the words of one factory owner, this is simply “the market price” for factory labor, where the lowest wage per unit production meets workers’ willingness to work. I suppose a case could be made for entrapment in rural factories, but for the most part, if workers get tired or aren’t making enough money, they just don’t come back after a holiday or payday. In fact, from this factory owner’s perspective (and probably more than a few of the migrant workers themselves) factory jobs represent an opportunity rather than a dead end. Over time, there are avenues to earn supervisory positions with a middle-class salary and/or to save enough money to buy a home or start a business. What’s exploitation and what’s working hard to get ahead? I have mixed feelings when I tour and engage with factories like these. On the one hand, I feel sad for anyone who needs to sacrifice that much of their life to get ahead (or just make a living). On the other hand, whereas I, and most of you reading this, can count a number of things we would rather do (and can afford to do) on the weekends rather than work, I think most Chinese factory workers approach their jobs with a fatalistic focus, which is to make as much money as possible in a given time. To them weekends and evenings off (with no pay) or improvements in material conditions in factory dorms or offices (in place of the salary that would be displaced to create these comforts) don’t make much sense. I would be very interested if you think this sounds like a “fair” working environment that would feel comfortable purchasing goods from. Here’s two quick questions to see what you think. I’ll publish the results next week. Posted on October 10, 2017 Leave a comment on How much work is too much? You, the buyer, want to make sure your goods are free from defects and made to a high standard of quality before you pay for them and they are shipped half-way around the world. It doesn’t make sense for you to travel to the factory to inspect these goods. In short, you need a third-party inspector. But how do inspections work? What do they really tell you? And who can you trust? First and foremost you need a clear, independently verifiable definition of “good quality,” “pass/fail” and/or “defects”. Having a physical approval sample is a great start, but what is your tolerance for differences against the sample? If the straps are 5mm too long is that a defect? What if the red material looks a little orangey? Does that plastic seem a little softer than before? If you’re serious about quality, you need scientific definitions and tolerances, even for the most mundane products. 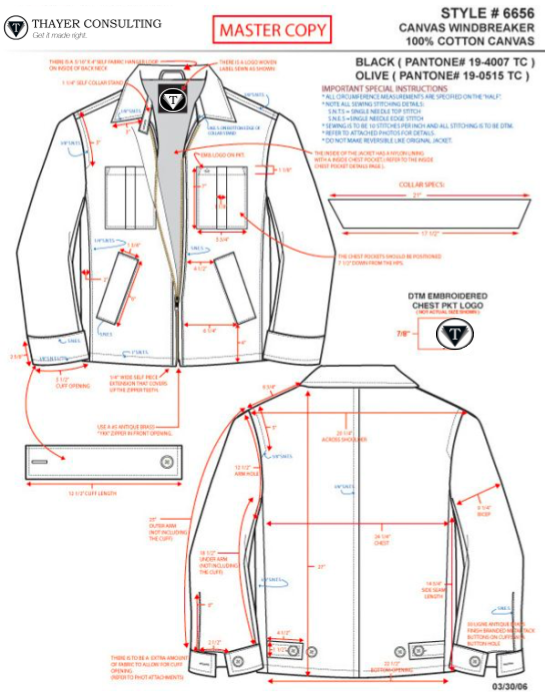 Think: “The strap should be 150mm long +/- 5mm from seam to seam,” “The red material should match Pantone 185C with a 10% acceptable tolerance,” “The plastic hardness should be between 60-70 degrees, using a hardness meter.” These quality specifications or “specs” can be compiled into a checklist, “tech pack” and/or arranged by seriousness (major/minor defects, for example). Armed with these quality specs, any inspector should come to the same conclusion about whether a unit of your product is defective or not. Next, you need to decide when to inspect. Will you inspect the raw materials as they arrive at the factory? Will you inspect mid-production to check progress and components before assembly? Or will you only inspect after the product is complete? Usually these decisions are made as a balance of risk and cost. The ultimate in micro-management would be to hire a proxy to sit in the factory for the duration of the procurement and production process, but that would probably be cost prohibitive. On the other extreme, you could roll the dice with a trusted factory and figure that even if you lose 5% of your order to defects you have saved more than that in the cost of inspection. All things being equal, the higher the price of product, the greater the quantity and the greater the risk of defect, the more valuable the inspection is to the buyer. Third, you must decide how the actual inspection will be conducted. 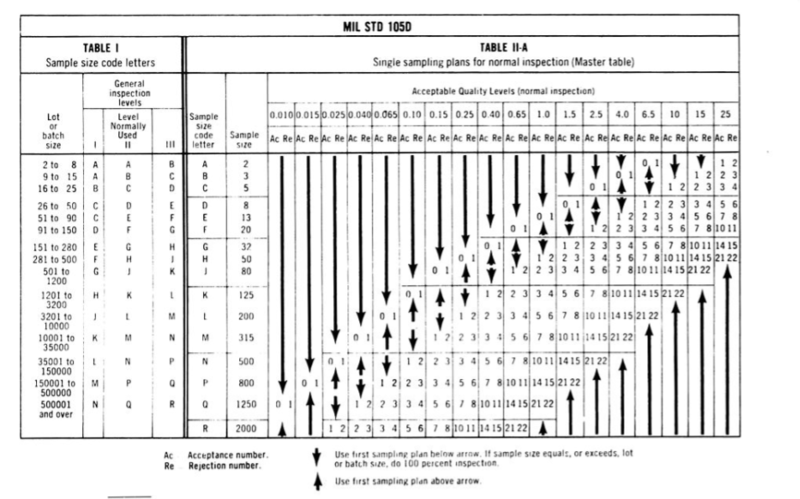 In exceptional situations, you might order a 100% inspection, but in most all inspections some version of Acceptable Quality Limit (AQL) is used to extrapolate the results of a random sample onto the entire lot (“lot” is industry jargon for all the units that make up an order). If less than a certain percentage of defects are found in the sample, then the entire lot is passed. If more than a certain percentage of defects are found, then more samples are inspected and if the defect rate is constant or grows then after a certain number of samples the entire lot is rejected. Your inspector should be able to explain AQL and suggest a procedure, based on tables that look like below. If they can’t, beware! Technically capable: They must be able to understand and apply your spec. Professional: They must be be patient with details, record results accurately and report in a timely manner. Properly incentivized: This person must value your future business over bribes and the warm glow of attention and power they will inevitably receive in the factory. Define the goals of the inspection and a scientific definition of pass and fail. Decide on a reasonable AQL percentage to inspect. I’ve assembled the Thayer inspection team with the above in mind. 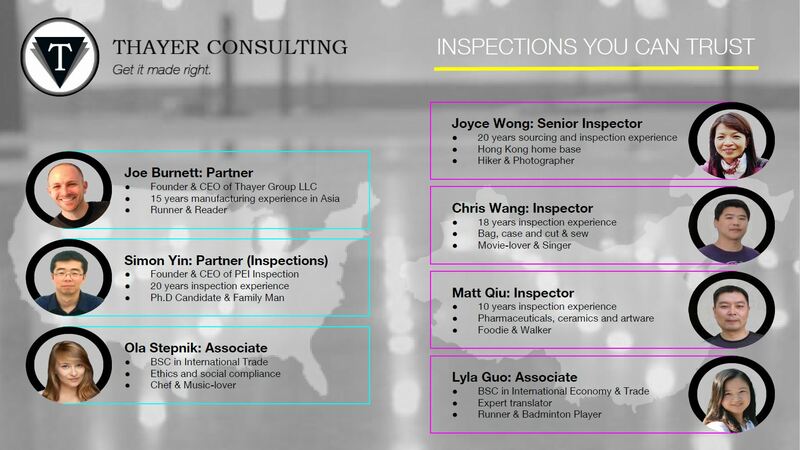 Posted on October 4, 2017 October 4, 2017 Leave a comment on How do inspections in China work? On Oct. 13, Maine International Trade Center (MITC) invited me to deliver the keynote address at their annual Import Forum for Maine small and medium-size businesses. MITC shared state and federal trade import data with me to prepare a macro-economic backdrop to importing goods to Maine. What I saw was not surprising to me, but might surprise anyone following US political media. One of the more important takeaways from the US trade data is that import trends closely match economic trends as a whole. Below you can see (on separate scales for ease of comparison) how closely the trends for total US economic output (shown in green) and volume of imports (shown in blue) match one another. In Maine, import trends also mirror economic growth, but in Maine this is mainly due to the state’s outsized energy industry. Since my audience and customers are non-energy businesses, I stripped away energy imports and had a look at import trends for non-energy businesses only to Maine. What you can see in the chart below is that for most businesses, import volumes (shown in orange) are growing faster (actually, shrinking less fast) than the economy as a whole (shown in blue). This means that Maine’s non-energy businesses are importing more of their total economic output over time so, in a sense, they are importing “more” than they used to. This is surprising, if not particularly exciting. If you watch TV or read the news, you’d expect to see data showing exponential growth in imports or great swings in the proportion of economic output that is coming from overseas. * What we actually see, in Maine anyway, is the somewhat more mundane reality that businesses that make and sell stuff are importing slightly more of what they make over time. But is this trend about to change soon? My prediction is no. The steady increase in global trade generally, shown above specifically, for imports to the US and ME, is facilitated in large part by free trade agreements that the United States cannot renegotiate or abandon by presidential executive action alone. So even if the current or future president tried to remove or implement further barriers to imports, it’s unlikely that congress would agree. That means that short-term changes to US policy and law either in opposition to free trade (such as abandoning NAFTA) or in favor (such as ratifying the TPP), are unlikely to occur. To me, all of this points to the continuation of the status quo, the slow and steady expansion of imports to the United States. In conclusion, I’ve attached some photos of an example of the type of infrastructure improvements that facilitate the expansion of international trade. This the international port terminal in Portland, Maine, which I toured before the MITC event and which is expanding steadily with government support. Thank you for your comments, suggestions and referrals! * A notable exception was published yesterday in the New York Times. If you negotiate too hard, you risk cut corners and poor quality. If you don’t negotiate hard enough, you risk handing the factory your profits. Everyone has his or her own negotiation style and there’s no single way to get the best deal, but here are some lessons I’ve learned that can enhance anyone’s bargaining skills in China without undermining quality and relationship down the road. Start as early as possible. Try to get a non-binding estimate at the outset to make sure you’re in the ballpark. You don’t want to spend weeks or months discussing a design just to find out that prices are 10 times those in your break-even model. Understand the factory’s costs. If the factory can provide you with a rough breakdown of materials, parts and labor (usually referred to as a “BOM” or “Bill of Materials”) you can independently verify those costs to estimate how much labor, overhead and profit the factory is including in their prices. If a factory’s prices are more than double the cost of goods, something isn’t adding up. Understand the factory’s incentives. Even more important than the above, if you can figure out what kind of customer or project the factory is looking for, you’re on your way to a bargain. Keep in mind the factory may be looking for more than just a source of big orders. Access to new markets, using a new type of technology or a genuine interest in your product can motivate just as much as projected profits in some situations. Try to find out what drives decision-making and investments at the factory and frame your project to fit to get the best deal. Sell yourself. Some people balk at this (“Why should I have to bend over backwards? It’s my money. The customer is king, right?”). 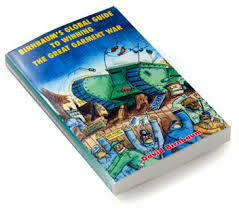 However, remember that in most cases the factory is both larger, more leveraged and more experienced than you are. A better way of thinking about selling yourself is showing the factory how well your goals align with theirs, i.e. when you win big, the factory will as well. If the factory believes in your vision and sees a valuable role in it, you’re bound to get better terms. Always have a competing quote. Finally and by far most important is to always have at least two quotes. Even if it is just an anecdotal second opinion from a friend, reference or Alibaba.com, it’s impossible to negotiate in a vacuum. The Chinese also use the expression, “Don’t put all your eggs in one basket.” Competition is an indispensable tool for negotiation in any setting. China is no different. All five of these tips are best followed when you have a personal relationship with your factory. Please contact me at joe@thayer-consulting.com if you know anyone who could use a hand with their Chinese manufacturing. 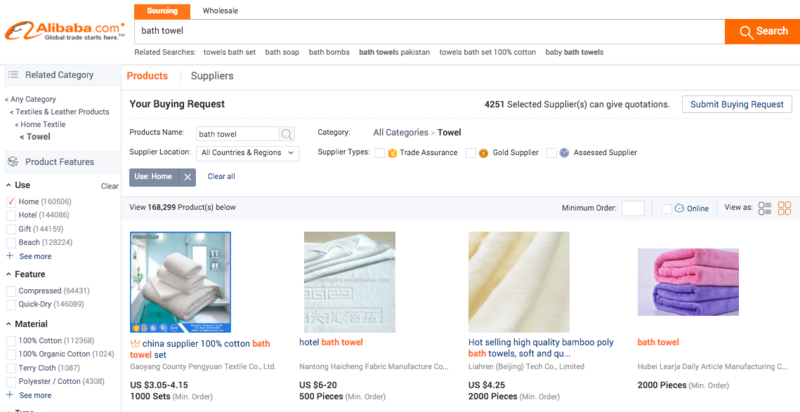 Posted on July 28, 2016 Tags china, manufacturing, negotiationLeave a comment on How to negotiate with Chinese factories? Base salary + guarantees a “non-exempt” worker a monthly (“base”) salary and then pays extra (“+”) based on how many overtime hours are worked and/or by how much a productivity quota has been exceeded. Piece rate is the traditional form of factory labor compensation. For every piece the worker produces, he or she is paid a fixed amount. Which types of factory jobs are compensated which way? Factory work can be usefully split into office work (supervising, selling, organizing, etc.) and production floor labor (cutting, sewing, packing, etc.). Generally speaking, office workers in Chinese factories are paid a fixed, monthly wage and workers on the production floor almost always have some kind of non-exempt, base salary + agreement linked to overtime or productivity. Straight piece rate wages used to be the norm in China, but now most factories guarantee their workers have some form of base wage. It’s impossible to generalize. China’s a big country with vast differences in wages, productivity and costs of living. All things being equal, average wages tend to be higher the closer you get to a city center and lower the further west you travel from the China coast. Surprisingly, in the last 10-20 years it is becoming more and more common for floor laborers to earn more than their front office counterparts. Skilled factory labor is growing scarce and the younger generation of Chinese may attach more value to the comfort of working in front of a computer than the extra money they might earn cutting, sewing or packing on a hot production floor. 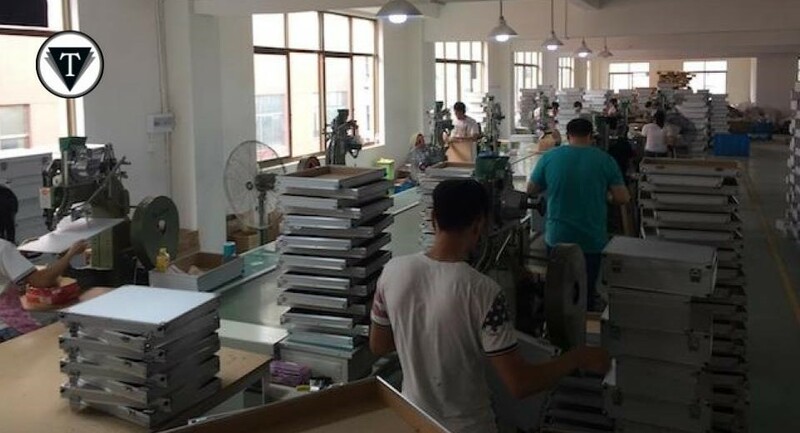 The workers are paid based on piece rates, but the factory basically guarantees them enough work that they can meet the 3000 RMB threshold by working regular hours of 8 hours a day, 6 days a week. To give you some perspective on their wages, my report estimated that average monthly living expenses in that town are roughly half their average income (between 1000-2000 RMB ($154-$308). If you’re wondering how much your workers make, what conditions they work in and how they’re paid, please email joe@thayer-consulting.com. Posted on May 4, 2016 4 Comments on How (and how much) do factory workers get paid in China? Weakening RMB = Time to ask your Chinese factory for a discount? I was recently reminded by one of my clients that the Chinese currency (Yuan, CNY, renminbi or RMB) had been depreciating steeply against the dollar. “Is this a good time to ask for a discount on my factory prices?” she asked me. If I were to choose one macroeconomic lever that has the most direct impact on a Chinese factory profits, it would be the exchange rate. The other economic statistics we see in the media (GDP growth, purchasing indexes, minimum wages, interest rates, etc.) are all important in their own right, but nothing impacts an export-driven factory’s profits more directly than exchange rates. I learned this lesson first-hand, while working for a Chinese golf bag manufacturer in Shanghai from 2006-2008. A factory has three main costs: labor, materials and overhead. Our factory, like most, almost always pays for all three in local currency, RMB. However, like many successful Chinese factories, especially at the time, we were exporting and selling to foreign customers, mostly American. Therefore, almost all our income came in the form of foreign currency, mostly US dollars or USD. Consider the microeconomic situation at our golf bag factory when I started working there in 2006. Let’s say at that time, for each golf bag we were paying about 20 RMB for labor, 100 RMB for materials and charging our customers 20 USD for a finished golf bag. After adding our OH costs and applying the prevailing exchange rate at the time (about 8:1) we were making a profit margin of roughly 15%. Note: All these figures are roughly, but realistically, contrived for explanatory purposes. Now, imagine the RMB strengthening against the dollar, which makes our factory’s materials, labor and overhead relatively more dear while making the USD from our customers less and less valuable. In the two years from the beginning of 2006 to the end of 2007, the value of the RMB versus the Dollar increased roughly 12.5%, from 8:1 to 7:1. In RMB terms, our factory’s expenses had not changed, nor had our USD prices to our customers, yet our profit margin decreased by more than 75%. For those unfamiliar with a “cut & sew” factory, 15% margins are decent for a medium size bag maker, but 3% is unworkable. Below you can see the detailed figures that illustrate this example. Our story was shared by tens, if not hundreds, of thousands of factories across China in 2007-2008. You may have read about the massive swath of factory shutdowns at the time. Mine was one of those. From the opposite (US government and media) perspective, anyone who’s read about China’s currency manipulations from a Western point of view will be very familiar with the story of China (and other export-driven economies) artificially depreciating their currency to boost their economy. Just apply the above exchange rate figures in reverse and you can see the opposite effect on profits. You’ve also probably read about the opposite situation as well, where manufacturing companies and economies are hurt by a strong local currency. (Japan has exemplified this problem in recent years.) Above is the microeconomic logic behind this. So, let’s return to my client’s question. Should she ask for a discount based on the recent devaluation of the RMB vs the USD? She currently pays about $5/piece for canvas bags. Last summer the exchange rate was about 6.2 RMB = 1 USD. When she approached me at the beginning of February the RMB was trading at about 6.6 to the dollar. This is the opposite effect that I described at my golf bag factory. 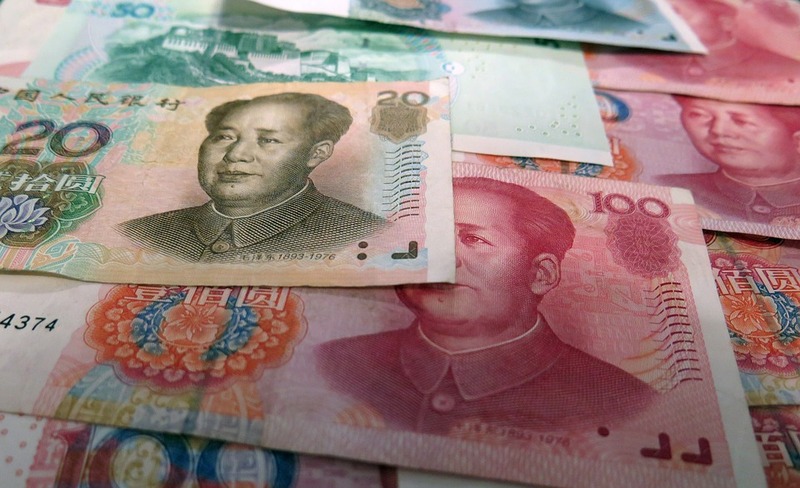 The Chinese factory was profiting from the decreased value of local currency. Her factory would appear to be pocketing an extra 25% in profits versus six months earlier, so at first glance, you’d think she’d deserve a share of that windfall. However, my advice was to hold off on re-opening price negotiations with her factory. Exchange rates can be a double edged sword: Will my client raise her prices when the RMB appreciates (as it already has in recent weeks)? The recent devaluation is relatively minor: Six percent is a lot for a trader managing billions of RMB, but a relatively small change in the context of my client’s order volume. In my client’s case, I suggested keeping this currency advantage as a bargaining chip when discussing other less sensitive costs like sample charges, minimums or payment terms in the coming months. If you’re wondering how exchange rates might affect your factory or import/export business, please email joe@thayer-consulting.com. Posted on April 8, 2016 1 Comment on Weakening RMB = Time to ask your Chinese factory for a discount?